Binding: Burgundy-colored cloth covered boards. Gold embossing on front cover and spine. Front cover details include a linear framing device with daggers in the corners, blades pointed toward center of cover. 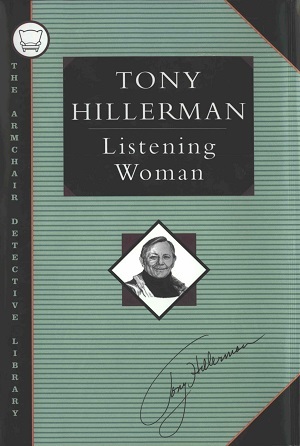 An inset hadn-drawn portrait of Hillerman is set on-the-bias at the center of the cover. The decorative elements of the spine replicates the cover's artifices, replete with a linear frame and corner daggers. A fifth dagger, aligned vertically with the spine, separates the novel's title from the author's name, both read horizontally along the length of the spine. The publisher's device, a throne-backed armchair, is set vertically, or perpendicular to the spine's lettering, at the bottom of the spine.